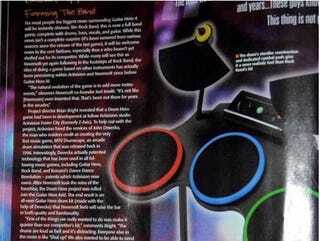 Someone over at the Destructoid blogs just posted a scan of the latest issue of Game Informer magazine, revealing the drum set for Activision's upcoming increasingly erroneously named Guitar Hero 4. The set ups the ante over Rock Band, having only three pads and a petal but adding two dedicated cymbals to the mix. Feels like a case of "but ours goes to eleven" to me, but they had to stay competitive somehow I suppose. Hit up the link for slightly more information, but if you really want the full scoop, pick up the latest issue of Game Informer magazine.